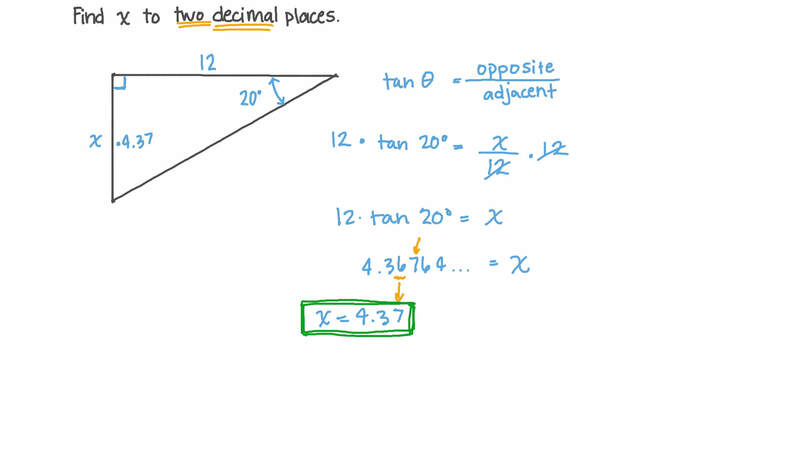 In this lesson, we will learn how to find an angle in a right triangle using the tangent ratio. Find the values of 𝛼 and 𝛽 giving your answer to the nearest second. 𝐴 𝐵 𝐶 is a right-angled triangle at 𝐵 , where 𝐴 𝐵 = 4 5 c m and 𝐵 𝐶 = 6 8 c m . Find the measure of ∠ 𝐶 giving the answer to the nearest second. 𝐴 𝐵 𝐶 𝐷 is a rhombus where 𝐴 𝐶 = 2 4 c m and 𝐵 𝐷 = 3 2 c m . Find 𝑚 ∠ 𝐵 𝐴 𝐶 giving the answer to the nearest second. 𝐴 𝐵 𝐶 is a right-angled triangle at 𝐵 where 𝐴 𝐵 = 1 9 c m and 𝑚 ∠ 𝐶 = 5 4 ∘ . Find the length of 𝐵 𝐶 giving the answer to two decimal places. 𝐴 𝐵 𝐶 is a triangle where 𝐴 𝐷 ⟂ 𝐵 𝐶 , 𝑚 ∠ 𝐵 = 5 1 1 6 ′ 1 8 ′ ′ ∘ , 𝐵 𝐶 = 2 0 c m , and 𝐴 𝐷 = 8 c m . Find 𝑚 ∠ 𝐶 giving the answer to the nearest second. The following figure represents a line segment joining two points 𝐴 ( 2 , 0 ) and 𝐵 ( 3 , 8 ) . Find the measure of the angle 𝜃 included between 𝐴 𝐵 and the 𝑥 -axis giving the answer to the nearest second. A flagpole 5.9 metres tall casts a 2.8-meter shadow. Find the angle of inclination of the sun giving the answer to the nearest minute. Find the value of 𝐾 , given 𝐴 𝐵 𝐶 is an equilateral triangle, where point 𝐷 lies on 𝐴 𝐵 , 𝐴 𝐷 = 5 c m , 𝐷 𝐵 = 1 2 c m , and 𝐾 𝑋 = √ 3 t a n .
Find 𝑥 to two decimal places. In the given figure, 𝑚 ∠ 𝐵 𝐴 𝐶 = 9 0 ∘ and 𝐴 𝐷 ⊥ 𝐵 𝐶 . What is 𝐴 𝐶 𝜃 t a n ? 𝐴 𝐵 𝐶 is a right-angled triangle at 𝐵 , where 𝐴 𝐵 = 6 4 c m . Point 𝐷 lies on 𝐵 𝐶 and point 𝐸 lies on 𝐴 𝐶 where 𝐸 𝐷 ∥ 𝐴 𝐵 . Find the length of 𝐷 𝐵 given 𝐶 𝐷 = 1 2 c m and 𝐸 𝐷 = 3 5 c m . Give the answer to two decimal places. 𝐴 𝐵 𝐶 is a right-angled triangle at 𝐵 where 𝑚 ∠ 𝐶 = 3 4 1 2 ′ ∘ and 𝐵 𝐶 = 2 5 c m . Find the length of 𝐴 𝐵 giving the answer to two decimal places. Find the exact value of t a n 𝐶 . The dimensions of a rectangular garden is 13 metres by 12 metres. Triangle 𝐴 𝐸 𝐶 represents the lawn where 𝐸 𝐶 = 1 0 m . Find the measure of ∠ 𝐸 𝐴 𝐵 giving the answer to the nearest second. 𝑋 𝑌 𝑍 is a triangle where 𝐿 lies on 𝑋 𝑍 such that 𝑌 𝐿 ⟂ 𝑋 𝑍 , t a n t a n 𝑍 = 𝑋 𝑌 𝐿 = 2 0 2 1 and 𝑍 𝐿 = 2 6 c m . Find the area of 𝑋 𝑌 𝑍 giving the answer to two decimal places. Find the length of 𝐷 𝐶 given 𝐴 𝐵 𝐶 𝐷 is a quadrilateral where 𝐴 𝐷 = 6 c m and 𝐴 𝐵 = 8 c m .
𝐴 𝐵 𝐶 is a triangle where 𝐴 𝐷 ⟂ 𝐵 𝐶 , 𝐴 𝐷 = 1 6 c m , 𝑚 ∠ 𝐵 = 4 4 ∘ , and 𝑚 ∠ 𝐶 = 4 8 ∘ . Find, to the nearest centimetre, the length of 𝐵 𝐶 . In the given figure, 𝑚 ∠ 𝐵 𝐴 𝐶 = 9 0 ∘ where 𝐴 𝐷 ⊥ 𝐵 𝐶 . What is 𝐴 𝐷 𝜃 t a n ? Find the value of t a n t a n 𝑥 + 𝑦 given 𝐴 𝐵 𝐶 𝐷 is a square where points 𝐸 and 𝑂 lie on 𝐴 𝐶 , 𝐴 𝐸 = 8 c m , 𝐸 𝑂 = 2 5 c m , and 𝑂 𝐶 = 9 c m .
𝐴 𝐵 𝐶 is a right-angled triangle at 𝐵 . Point 𝐷 lies on 𝐵 𝐶 and point 𝐸 lies on 𝐴 𝐶 where 𝐸 𝐷 ∥ 𝐴 𝐵 . Find the area of the trapezium 𝐴 𝐵 𝐷 𝐸 given 𝐴 𝐵 = 2 4 c m , 𝐶 𝐷 = 3 5 c m , and 𝐸 𝐷 = 1 2 c m . Give the answer to two decimal places. 𝐴 𝐵 𝐶 is a right angled triangle at 𝐵 . Find the area of 𝐴 𝐵 𝐶 given that 𝐴 𝐵 = 2 4 c m , 𝐷 ∈ 𝐴 𝐶 , 𝐸 ∈ 𝐵 𝐶 , 𝐷 𝐸 ⟂ 𝐵 𝐶 , and 5 𝐷 𝐸 = 6 𝐸 𝐶 . Round your answer to two decimal places. 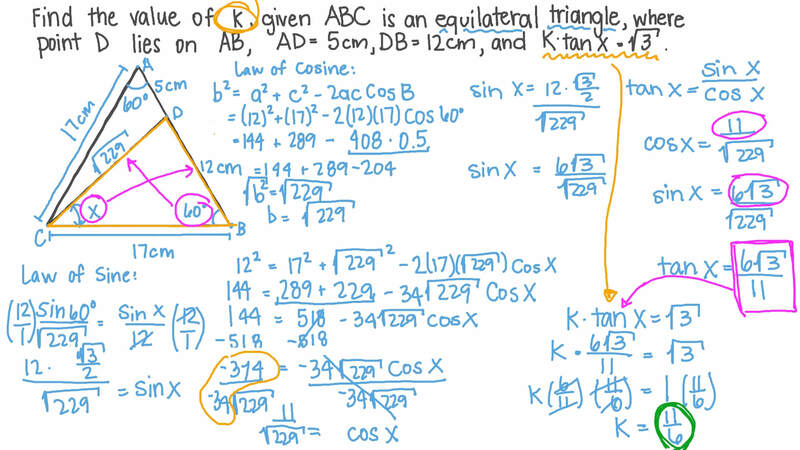 Find the value of t a n t a n 𝐵 𝐶 given 𝐴 𝐵 𝐶 is an isosceles triangle where 𝐴 𝐵 = 𝐴 𝐶 = 4 5 c m and 𝐵 𝐶 = 7 2 c m .
𝐴 𝐵 𝐶 is a triangle where 𝑏 = 1 3 √ 3 𝑎 and 𝑚 ∠ 𝐶 = 1 5 0 ∘ . 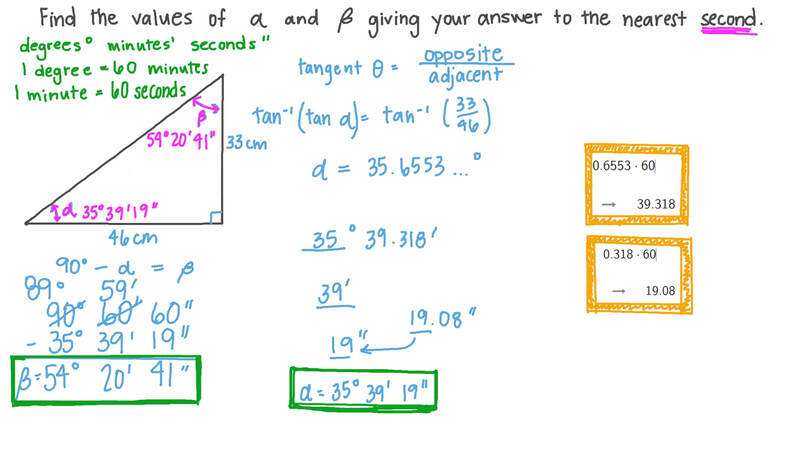 Find the value of t a n 𝐴 without using a calculator. In the given figure, the two triangles are similar. Work out the value of t a n 𝜃 for △ 𝐴 𝐵 𝐶 . Give your answer as a fraction in its simplest form. Work out the value of t a n 𝜃 for △ 𝐷 𝐸 𝐹 . Give your answer as a fraction in its simplest form. What can be said about the value of t a n 𝜃 for two similar triangles? CThey will never be equal. 𝐴 𝐵 is a diametre of a circle with radius 17 cm. Point 𝐶 is on the circumference of the circle where 𝐴 𝐶 ⊥ 𝐶 𝐵 and 𝐴 𝐶 = 1 6 c m . Find the exact values of t a n 𝐴 and t a n 𝐵 .